If Chelsea would’ve won today, United could’ve had few complaints. They are the best side I’ve seen at Old Trafford since City were last here in March. In the 52nd minute, a stroke of genius from Eden Hazard saw him clean through on goal. All around me, we were all awaiting the inevitable goal yet somehow de Gea pulled off an unbelievable save. From the resulting corner, Didier Drogba did what he’s been doing for the best part of the last twenty years, by losing Rafael da Silva, his marker, and scoring a free header into de Gea’s near post. There are rumours that Rafael is on borrowed time with Louis van Gaal; this won’t have helped his cause if that is the case, as popular a lad that he undoubtedly is. A half time promotion on the pitch for Russian airline Aeroflot, United’s official carrier. Where exactly they carry United is a moot point. Southampton? Swansea? New’astle? All feminists reading this will be pleased to know that the girls were made very welcome on the pitch. It seemed to take United five minutes to realise that Chelsea were just content to knock the ball around the midfield without any intent of scoring before they woke up. 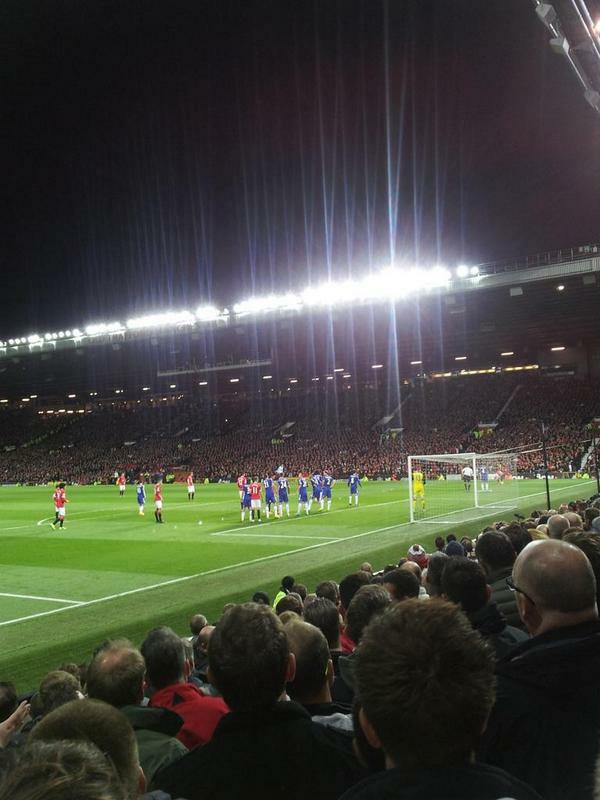 Chelsea looked comfortable, Robin van Persie was anonymous and United were blunt in attack. With four minutes of injury time granted, Chelsea were seeing the game out when Branislav Ivanovic fouled di Maria to earn himself a second booking. From the free kick, Marouane Fellaini made a nuisance of himself to force a save out of the outstanding Chelsea keeper Thibaut Courtois, but he could only parry the ball out to Robin van Persie from six yards out. Van Persie, who had done next to nothing during the match (or over the past few weeks come to think of it), did what all great centre forwards do and grabbed his opportunity. Chelsea fans near to me were sickened. If I was a Chelsea fan, I would’ve been too. They had this game in the bag and, were it not for a moment of stupidity from Ivanovic, they would’ve gone home with three points. United fans went mental with joy. Nobody will admit it, but we were resigned to a Chelsea win. Should United manage to get in the top four this season, this could be the day when their luck changed. The truth is, after the performance of the United defence at The Hawthorns on Monday night and the thought of the same defence coming up against Hazard and Diego Costa (we’d all forgotten about Drogba), I would’ve taken a draw before kick off. This was probably United’s best performance of the current season to date. They’ve gone toe to toe against the best side around on present form. They could’ve won, could’ve lost, but a draw was probably the fairest result. It’s a result I would’ve taken before kick off. Yesterday City played poorly at West Ham and deservedly walked away with nothing. The problem they have is that good champions go to places like West Ham, play badly and (generally) steal three points. As bad as City were yesterday, they won’t be that bad next week, you can bet your life on it. Even before all the oil money came to the Tripe Colony in 2008, they’d give United a game no matter how bad they were (and Christ, they were bad). That much hasn’t changed even though they’re now an excellent side (or ‘top, top’ in modern parlance). The United match to them is what the Liverpool match is to us, so they will be well up for it. By the way, I haven’t got a ticket for next week’s match, but I have heard that City are operating a buy one get one free. I say you buy one, you get one free scheme for their home matches. If any of my blue friends out there feel like sorting us one out, it will be much appreciated.